The film opened during the Nazi German 1940 Blitzkrieg (air bombings) of London, with sounds of explosions and sirens threatening the household of the Pevensie family in Finchley, as they fled from their home to a backyard underground shelter. The four children were: the eldest Peter (William Moseley), the highly logical and pessimistic Susan (Anna Popplewell), petulant and surly Edmund (Skandar Keynes), and young, adorable and sweet Lucy (Georgie Henley). They exhibited early signs of squabbling - especially young, troubled, and disobedient Edmund, jealous of his more perfect older siblings [during the air raid, he disobeyed and risked lives to save a picture of his father, who was away at war]. They were evacuated by train from the city to the rural town of Coombe Halt, and the country home of eccentric uncle, Professor Digory Kirke (Jim Broadbent), who wasn't "accustomed to having children" in his house. During a game of hide and seek on a rainy day, Lucy found a curtain-covered, tall wooden wardrobe (or armoire) in a spare room that she backed into for a hiding place, and found herself in a winter fantasy world of ice and falling snow within a deep forest. At a lampost, she also discovered a half-human, half-goat faun (or satyr) with hooves named Mr. Tumnus (James McAvoy), who was astonished to find a 'human' in his world of Narnia. Over tea, toast, and cakes next to a roaring fire in his rock-cave dwelling with his "new friend," Tumnus explained how Narnia hadn't experienced Christmas for 100 years ("Always winter, never Christmas"). Playing his flute for her, the "terrible faun" hypnotized her and informed her she was being kidnapped. He blamed the White Witch: "She's the one who makes it always winter, always cold. She gave orders. If any of us ever find a human wandering in the woods, we're supposed to turn it over to her." But the faun had misgivings about his plan to betray her - he apologized, and risked everything to return the innocent and sweet girl to her home, while fearing the Witch's spies. Lucy emerged from the wardrobe back in the Kirke house, realizing that no time had elapsed at all, although she thought she had been gone for hours. Her brother Peter was just finishing counting to 100 for their game. She showed her doubting siblings the wardrobe, but its portal to Narnia had disappeared - she tried to convince them: "But I wasn't imagining!" Later that evening, Lucy returned to the wardrobe, with Edmund following, and they entered into Narnia (Edmund affirmed: "I think I believe you now"). He was apprehended by a bearded dwarf driver, named Ginarrbrik (Kiran Shah), steering a reindeer-drawn ice sleigh commanded by the White Witch Jadis (Tilda Swinton), the self-proclaimed Queen of Narnia with blonde dreadlocks. He was magically offered a cup of drink and charmed with some tempting Turkish Delight candy. The childless Queen suggested that he could become Prince of Narnia one day - and "maybe even King," in exchange for bringing his three family members to her castle located between two hills in the distance. Edmund was intrigued by the promise of attaining superiority over his brother. Edmund met up with Lucy (after she had reunited with Mr. Tumnus), realizing that he may have told the Queen important information (that later betrayed Mr. Tumnus) in exchange for candy. The two returned to tell the others about the wardrobe (Lucy: "It's all in the wardrobe like I told you"), but Edmund stubbornly refused to admit his presence there, presumably to cover up his new acquaintanceship with the Queen: "I was just playing along." He told them that Lucy was only pretending. Upset, Lucy ran sobbing from the room, and bumped into Professor Kirke, who then spoke to Peter and Susan in private and asked why they didn't believe their younger sister's story about "a magical land in the upstairs wardrobe." He told them: "Well, if she's not mad and she's not lying, then logically we must assume she's telling the truth." During an outdoor game of cricket, the four siblings accidentally shattered a window, and hid from the angry housekeeper Mrs. Macready (Elizabeth Hawthorne) by entering the wardrobe - and all of them emerged in Narnia. Susan gasped: "Impossible," as Lucy quipped: "Don't worry. I'm sure it's just your imagination." Peter apologized to Lucy for not believing her earlier, and then forced his younger brother to also apologize: "You little liar...Apologize to Lucy. Say you're sorry!" Dressed in fur coats borrowed from the wardrobe, they went in search of Mr. Tumnus, who they discovered had been seized by Her Majesty and charged with High Treason (for fraternizing with humans), and taken away by Wolf Maugrim (voice of Michael Madsen), Captain of the Witch's Secret Police. They were led by a bird to meet with Mr. Beaver (Ray Winstone), who took them to his abode and described how there was hope in helping Mr. Tumnus - by the messianic figure of Aslan (the film's Christ figure): "Aslan is on the move...the king of the whole wood. The top geezer. The real King of Narnia." According to Mr. Beaver, Aslan was waiting for them at the Stone Table. Mr. Beaver explained how everything was happening according to a prophecy after their arrival, because they were the two sons of Adam and the two daughters of Eve: "When Adam's flesh and Adam's bone sits at Cair Paravel in throne, the evil time will be over and done." Their presence and their mission was to defeat the White Witch and restore peace to Narnia. Meanwhile, Edmund had surreptitiously left the group and ventured to the Witch's castle on his own. Mr. Beaver feared the Witch's ploy to have Edmund (as bait) lead them to her: "The Witch wants all four of you...to stop the prophecy from coming true. To kill you!" Inside her castle, Maugrim led Edmund to the Queen herself, who yelled angrily at him: "How dare you come alone?!" When he told her the other three were halfway there with the Beavers, she sent Maugrim and a pack of wolves after them. They narrowly escaped by following a tunnel, and then were aided by a Fox (voice of Rupert Everett) who told the wolves that they had fled north. Edmund was confined to a dungeon cell with a chain, next to a cell holding Mr. Tumnus. When the Queen arrived to question Edmund further about the whereabouts of his family, Mr. Tumnus was able to convince Edmund to stop divulging information about Aslan. The faun was unchained and told that Edmund had turned him in for "sweeties." Mr. Tumnus was then brought upstairs from his cell (and later revealed to be turned into stone), as the Witch rode in her sleigh (with "Son of Adam" Edmund) to pursue the other Pevensie children. They were told: "These are tools, not toys. Bear them well and wisely." He announced before departing: "Winter is almost over, and things do pile up when you've been gone a hundred years. Long live Aslan!" The changing climate conditions revealed that the ice was thawing, causing the river to flow more treacherously. The group was threatened again by the wolf pack and pursuit by the Queen, but they managed to cross on a cracking ice floe, holding on to Peter's sword, to avoid capture. The Queen-Witch was angered by the warming in the woods and the blooming trees, rendering her sleigh impassable. She threatened to kill the Fox when he refused to answer questions. Edmund divulged that his siblings were on their way to rendezvous with Aslan and his army at the Stone Table. With her staff, she turned the Fox into stone as punishment, as she vowed: "If it's a war Aslan wants, it's a war he shall get." The trio arrived at Aslan's encampment, where the great lion's soldiers (embodied by humans, centaurs, satyrs, flying wildcats, cheetahs and horses) were readying themselves for war. Aslan (a CGI creation, with voice of Liam Neeson) emerged from his tent as a huge and majestic lion with a mane. He welcomed the group, and then was told they needed to free their brother Edmund from the White Witch, even though he had betrayed them [Edmund was the film's Judas figure]. A doubtful and reluctant Peter was promised by Aslan that one day (according to the prophecy), he would sit as High King on one of four thrones at the castle Cair Paravel, viewed in the distance: "There is a Deep Magic more powerful than any of us that rules over all of Narnia. It defines right from wrong, and governs all our destinies. Yours and mine." Aslan promised: "I will do what I can to help your brother." Two of the White Witch's wolves ambushed Lucy and Susan as they splashed at the army camp's river bank. Susan sounded her warning horn to summon Peter, who bravely attacked and killed Maugrim with his sword. Shortly after, Aslan anointed Peter as Knight of Narnia to help him in battle. The second wolf retreated, as Aslan's second-in-command centaur Oreius (Patrick Kake) and some of his soldiers were ordered to follow the wolf back to locate Edmund. They found him, rescued him and released him from imprisonment. Back in camp, Aslan spoke with Edmund privately, and then told all the children: "What's done is done. There is no need to speak to Edmund about what is past." The four siblings reconciled and hugged, and were resolved to stay together and prepare for battle. The Queen arrived at the encampment to negotiate with Aslan for the traitorous Edmund, whom she claimed was still her lawful property ("Every traitor belongs to me. His blood is my property"). Aslan refused to have her recite the "Deep Magic" to him, as she threatened: "All of Narnia will be overturned and perish in fire and water. That boy will die on the Stone Table as is tradition. You dare not refuse me." After talking alone secretly in his tent, Aslan announced that the Queen "renounced her claim on the Son of Adam's blood" -- however, that night as Susan and Lucy accompanied Aslan in the forest, after awhile he told them that he must go alone ("It is time. From here, I must go on alone...You have to trust me, for this must be done...And farewell"). They watched secretly from afar as Aslan proceeded alone to the altar at the Stone Table, through a gauntlet of the White Witch's hideous followers. After the "great lion" was humiliated and laughed at - without fighting back, he was bound up and his glorious mane was shaved. Aslan was then dragged to the altar where the White Witch told him: "Did you honestly think by all this that you could save the human traitor? You are giving me your life and saving no one. So much for love." She stood and announced to the cheering, frenzied crowd: "Tonight, the Deep Magic will be appeased. But tomorrow, we will take Narnia forever! In that knowledge, despair and die!" She then plunged her dagger into Aslan's side to kill the "Great Cat." When the evil Queen's throngs (composed of ogres, dwarves, wolves and minotaurs) left to prepare for battle, Lucy and Susan went up to the altar to grieve over Aslan's corpse. Lucy thought to sprinkle some fire-flower juice on Aslan, but Susan told her: "It's too late. He's gone." But she added: "He must have known what he was doing." They noticed mice chewing through the ropes that bound Aslan, and Susan felt they must quickly leave to tell the others about the grave news ("They need to know"). The trees rustled and the wind blew as the next morning arrived. Peter was reluctant to lead the troops in battle as the Witch's army neared, although Edmund persuaded him: "Aslan believed you could. And so do I." Although Peter's army was outnumbered, he proceeded to prepare to fight valiantly ("For Narnia and for Aslan"), riding a white steed with his sword drawn. The Queen vowed, in her spiky chariot drawn by polar bears: "I have no interest in prisoners, kill them all." During the pitched, ferocious battle, as Susan and Lucy were leaving the Stone Altar, they felt rumblings in the Earth as the Altar cracked in half and Aslan vanished, but was soon resurrected in the bright sunlight. He told them: "If the Witch knew the true meaning of sacrifice, she might have interpreted the Deep Magic differently. That when a willing victim who has committed no treachery is killed in a traitor's stead, the Stone Table will crack and even death itself will turn backwards." They climbed on Aslan's back as he raced them overland to the Witch's castle, where he unfroze all of the imprisoned stone statues with the heat of his breath (including one of Mr. Tumnus), to provide reinforcements. In battle using Father Christmas' tools, Peter's army fought well, but Centaur Oreius was transformed into stone by the Witch's staff. Edmund was also stabbed and seriously wounded after he successfully neutralized the Witch's staff-weapon. As Peter fought one-on-one against the Witch, a roaring Aslan appeared with reinforcements, causing him to be distracted and face death from her sword, but Aslan jumped to the rescue, knocked the Witch down and killed her. He then turned to Peter and said: "It is finished." As the Witch's dwarf Ginarrbrik approached to kill Edmund lying on the ground, Susan shot an arrow into his heart to save her brother. Lucy healed him (and others) with drops of fire-flower juice, while Aslan (with his breath) continued to reverse the effects of the Witch's stone-statue spell. "May your wisdom grace us until the stars rain down from the heavens." Lucy watched from afar as Aslan walked away on the wide expanse of beach below and disappeared. Mr. Tumnus told her: "We'll see him again...In time. One day he'll be here and the next he won't." Years later, the older Pevensies, who had remained in Narnia as rulers, were riding their horses through the forest while chasing a white stag. They came across the lamppost - a landmark, where Lucy led them back into the wardrobe and to the land of England - they fell out of the front of the wardrobe - as children. The Professor entered the spare room, carrying the cricket ball that had broken the window earlier - he asked what they had been doing in the wardrobe. Peter replied: "You wouldn't believe us if we told you, sir." He tossed the ball to Peter and responded: "Try me." During the credits, Lucy attempted to enter the wardrobe and return to the land of Narnia, but the Professor advised her: "I don't think you'll get back in that way. You see, I've already tried." He said that they might get back some time, however - "But it'll probably happen when you're not looking for it. (whispering) All the same, best to keep your eyes open." The wardrobe door opened slightly after they left hand-in-hand from the room, and Aslan's roar was heard. The Lion, The Witch, and the Wardrobe (1950) was the first of seven books in The Chronicles of Narnia series of children's fantasy books written by author C.S. Lewis. With three Academy Award Oscar nominations and one win: Best Makeup (win), Best Sound Mixing, and Best Visual Effects. With a production budget of $180 million, and box-office gross receipts of $292 million (domestic) and $745 million (worldwide). 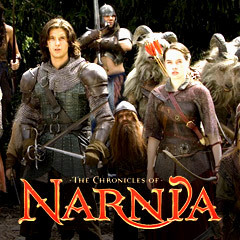 It was the highest grossing (domestic) film of the three-part film series of Narnia films. It was the second highest-grossing (domestic) film of its year, falling way behind Star Wars: Episode III - Revenge of the Sith (2005) at $380 million, but just beating the # 3 film, Harry Potter and the Goblet of Fire (2005) at $290 million. With the tagline: "Some journeys take us far from home. Some adventures lead us to our destiny."